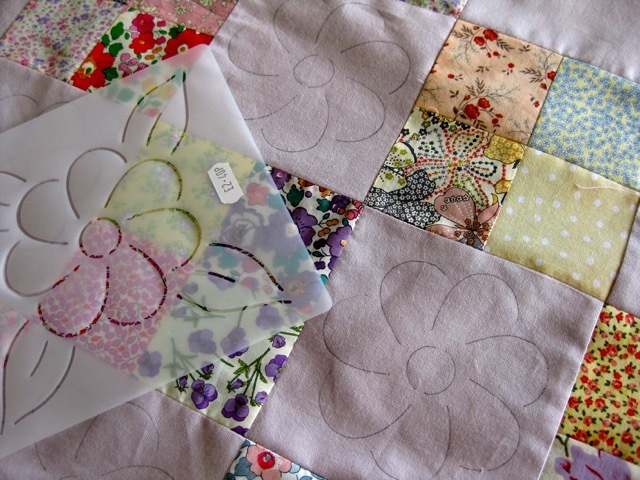 Top and backing are ready, it's time now to prepare the hand quilting pattern. I am glad that, searching among all my stencils, I found the perfect one to fit in the plain squares. To draw the lines on the fabric, I am not using anymore the blue washable marker, too expensive and getting dry too fast. I am very satisfied with the charcoal pencil 2B that is almost invisible once stitched above, and completely invisible after the first washing. Next step basting... in my next post. Your flower is the perfect size! Can't wait to see your progress as you quilt this one! Happy stitching to you! Un joli patch réalisé entièrement dans la pure tradition et quilté main..c'est très agréable et on voit les avancées petit a petit ! Bravo !! Merci Agnes, je suis contente de reprendre le quilting main. That is a perfect stencil for the space! Enjoy hand stitching! Perfect way to use your stencil. I will enjoy watching your progress with your hand quilting! This is going to be so cute! I agree--those pens dry up way too fast for what we pay for them! I LOVE the vintage look of this quilt! The liberty fabrics are soooo beautiful. Well done Christine!!! That flower stencil is great. 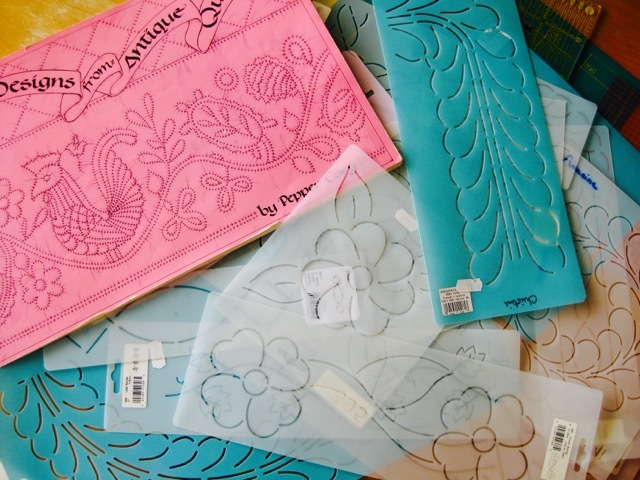 You have many pretty stencils. I am looking forward to seeing the finished quilt. Thanks for sharing your stencil marking, I am not good at that and try to avoid it by using straight lines, but I would like to try some new stencils I have. Off to buy a charcoal pencil! Nice to see someone else using pencil. I have seen far too many horror stories with those blue pens to ever want to try them. My very first quilt I use blue ball point pen....I did not know any better. But, with Fels Naptha and a little nail brush it all came out. After that I switched to pencil...that was over 20 years ago and never had any problems getting the marks out. I will have to try the stencils...great idea for variety as I usually draw a loop de loop, free hand. Your flower stencil is a perfect fit. I too use the pencil to mark or the hera marker. I agree those blue pens sure don't last long and I have never had the soft lead pencil not wash out! Is that a Pepper Cory stencil with the bird on it? Looks very Pennsylvannia Dutch! Your flower is the perfect touch for this quilt. Thank you for the marking tip! 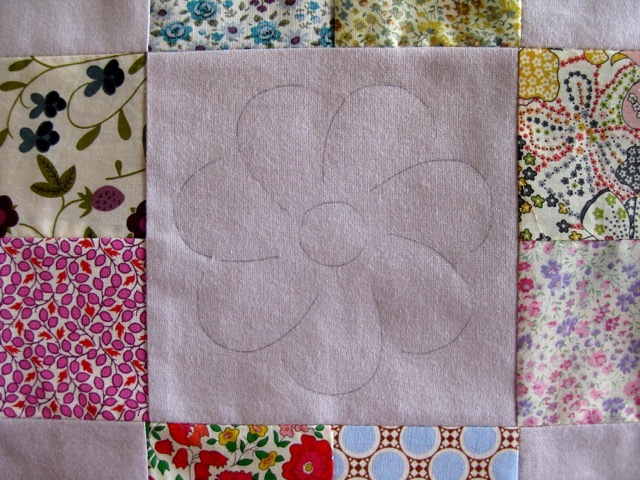 The flower pattern fits perfectly within the square you wish to quilt. Great choice. 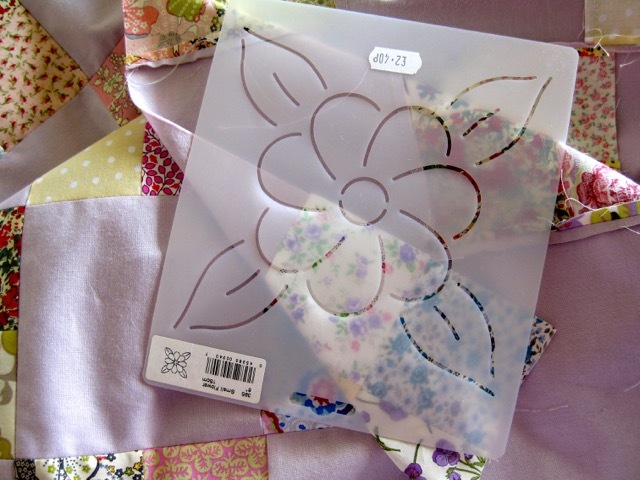 That flower design is just right for your quilt! I always have a hard time deciding how to quilt a quilt. The flower stencil is perfect! I also use a charcoal pencil. I really enjoy your posts Christine and am looking forward to your quilting progress. This is such a beautiful quilt. un très joli quilting en perspective ! Your pattern would suit perfectly your quilt! 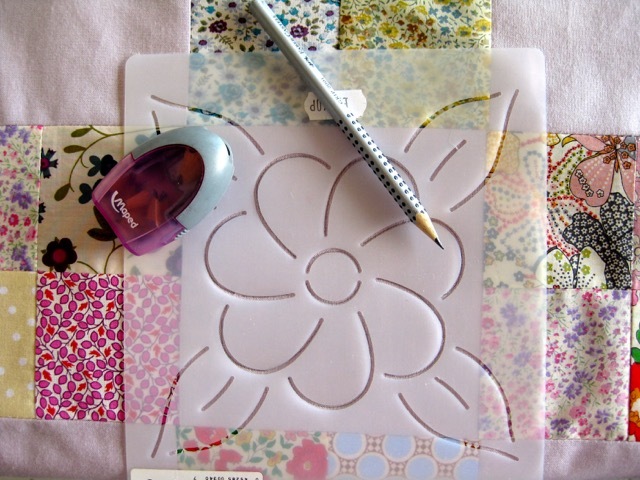 Those flowers drawn using the stencil are perfect for those squares. Can't wait to see how cute they look all stitched up! I am always afraid to use a pencil for marking, I will have to try this one. I was wondering what you used to mark with and if it comes out. I have so much trouble with seeing the marks when using stencils. These look nice and easy to follow. Perfect quilting pattern! Yes, I've had problems before with blue pens & now use a soft pencil. Look forward to watching your progress with this! A charming stencil for a charming quilt. I see you have Pepper Cory's book in your first photo. She taught me to hand quilt.Wonderful teacher! Perfect! I love stencils too!